Citrus seeds = easy houseplants! If you've eaten more than, say, five fresh citrus fruits in your life, I'll bet you've picked out and thrown away some seeds. 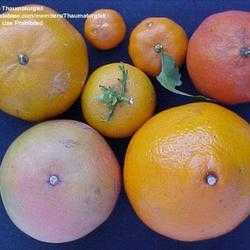 Many edible citrus have plump white seeds in the center. Have you considered trying to grow them? It's easy! Pop them into a pot and grow an easy-care, attractive houseplant. Oranges, limes, lemons, grapefruits, pummelos; all of these belong to the genus Citrus and their seeds can be grown using the same basic care. 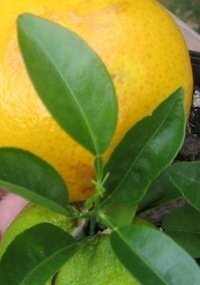 Growing citrus seed is a super-cheap way to get a midwinter gardening fix and new houseplants too. And if they fail? No big investment down the drain. To paraphrase some wise person, if life gives you lemons, make another glass of lemonade and plant the lemon seeds. I'll let you know this up front--citrus plants you grow from seed are not always good candidates for producing fruit you'll enjoy. 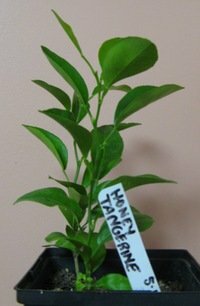 I'm not giving you the secret to starting your own orange grove. But baby oranges, lemons or grapefruits live happily on a sunny windowsill in cool weather and a sunny garden spot in warm seasons. 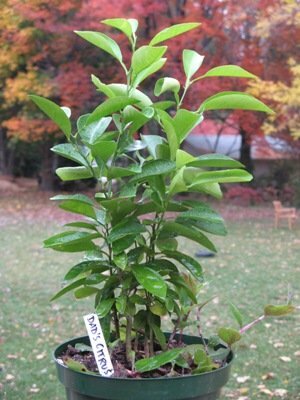 Citrus trees have pretty, slightly leathery and shiny, deep green leaves. They'll start to branch at several inches tall, or after you clip off --or a cat nibbles on--the growing tip. 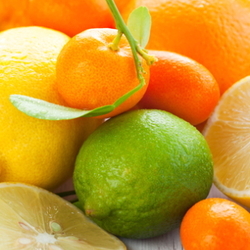 Luckily, citrus plants are non-toxic and safe for your pet to nibble on. Some may develop spines, although that trait hasn't received many complaints among the PlantFiles comments. Many citrus houseplants eventually flower. Cut a citrus fruit and save five or ten (they might not all grow) of the plumpest, biggest seeds you find. They should stay fresh and moist until planting. Plant them the same day or rinse with water and refrigerate in a plastic bag for a few days. 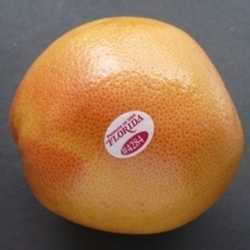 (Not all citrus fruit you buy will have seeds; some might be labeled as seedless. Tiny white specks in the fruit are not viable seeds. Skinny, shriveled white seeds are not good candidates to give you a strapping seedling.) Put your five to ten seeds about a half inch under the surface of moist soil in a three to four inch plastic pot. Cover the pot with clear plastic wrap to hold in moisture while you watch for that first exciting sprout, and keep it in a warm place. Good light is not needed yet. In fact, a bright sunny windowsill location might dry out the soil and hinder germination. And a bright sunny window in winter can become a very chilly spot at night. Be patient. It often takes two weeks or more for sprouts to pop up. After those exciting green nubs appear, remove the plastic and put the plant in a well-lit, warmish spot. Five plants in a small pot makes a nice full plant sooner than keeping one per pot. Another benefit is that you're less likely to overwater with five together. (Overwatering and keeping potted plants too wet is one of the commonest mistakes that indoor gardeners make.) Your citrus will benefit from fertilizer. Buy one labeled for general indoor plant use with micronutrients. A five dollar bottle of good liquid concentrate fertilizer will last a long time. As houseplants, citrus are pretty bug-free. Little citrus trees grow somewhat slowly when young, like other baby trees. If you'd like to grow them for a gift, you probably want to allow several months from seed to special occasion. Your citrus will grow best in a bright warm place. If I have to admit they have a weakness, it would be that they may not do well in very low light. After a few years of good care, your citrus should present you with flowers. Though small, citrus flowers have a pleasant scent ranging somewhere between "wonderful" and "incredibly sweet." When you have blooms, you may then see fruit. You might be very lucky and have eating quality fruit on your tree, but don't count on it. Commercial citrus growers do not start their trees from seed. Citrus plants can be moved outside for summer and will grow even better for it. The outdoor environment, while beneficial to them, is also more demanding. As with all houseplants, make the transition gradually. Place the plant out first for a short daytime jaunt in a sheltered spot. Just a week of coddling should be enough to let them adapt. If during this transition, you suddenly find pale or white areas on the leaves, they have probably gotten too much sun. Give them a few more days of shade and they'll adjust and recover. Citrus houseplants seem pretty much pest free. If you suspect a problem, I'd recommend you read Common Houseplant Pests by Lee Ann Stark for diagnosis and treatment. Spider mites and mealy bugs are mentioned by some owners. Problem insects have been a rare sight on my lemons and grapefruits, and easily eliminated. I've grown lemons, grapefruits and tangerines with nary a problem. For a practically-free, lush small houseplant, it's hard to beat your own seed-grown citrus. All photos taken by and are the property of author. Sally grew up playing in the Maryland woods, and would still do it often if life allowed! Graduate of University of Maryland, her degree is in Agriculture. Gardens and natural areas give her endless opportunity for learning and wonder. Naturally (pun intended) her garden style leans towards the casual, and her cultural methods towards organic. She likes to try new plants, and have "some of everything" in her indoor and outdoor gardens. Thanks go to her parents for passing along their love of gardening and nature, and her husband and kids for being patient when she gets lost in the garden. Follow her on Google.